With unparalleled access to Heisman Trophy-winning phenom Johnny Manziel, Bruce Feldman has written a modern-day tale about the making of the next superstars in football's most important position: the quarterback. In the world of modern football, with NFL teams worth more than a billion dollars, no position defines a franchise like the quarterback. 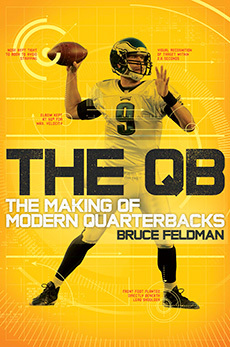 The QB is the story of a year in the making of those star players, and of the most significant year in QB development in sport’s history… with the meteoric rise of various quarterback gurus finally coming to light. George Whitfield, profiled in the New Yorker and called the “Quarterback Whisperer,” gets a regular spot on ESPN’s College GameDay, Trent Dilfer, former Super Bowl quarterback, starts his own qb business, Steve Clarkson, another qb maker, gets profiled on 60 minutes, among many others. It is also the year 5’10” Russell Wilson wins the Super Bowl and for the first time in over 60 years a sub-6-foot QB, Johnny Manziel, gets drafted in the first round, forcing NFL power brokers to re-examine how they look at the position—and the game. To tell the story of all that goes on to create the perfect quarterback, bestselling author Bruce Feldman gained unique access to "Johnny Football" (that's Johnny Manziel), George Whitfield and many other players in what has become a specialized and high-stakes business. In the past decade the boom of the private quarterback-coach business, with its pageant-world-for-boys vibe, has changed the position and the game. The QB tells the story of the interlocking paths of the most fascinating characters involved in this secretive world, examining how advanced analysis has taken root in football. Manziel’s portrait is the most intimate look at him yet, detailing all his talents and antics. His guru is a man who has come to be known for making QBs--George Whitfield, unparalleled in the business. And then there is Trent Dilfer, the quarterback who never could get to the superstar level, despite winning the Super Bowl. He is the Salieri to Manziel's Mozart. There is the computer/brain analysis company trying to quantify how playmakers think, the biomechanics expert who saved Drew Brees’s career, and many more fascinating behind-the-scenes looks into this world. Never before has the game so relied on the development of the quarterback. In The QB, the stories of these men illustrate how high the stakes of the quarterback’s game really are, taking readers on a compelling journey into the heart of America's beloved game. "Bruce Feldman knows his way around football and locker rooms as well as anyone I know. His understanding of the intricacies of the sports and of reporting is why a book like this one is a wonderful read."